Among other things, meditation teaches us to be mindful of our thoughts. There was a point years ago (early in my practice) when I was overwhelmed by all the thoughts that floated by in my head. Once you stop what you are doing and actually listen to your mind ramble on; well, it can be a little unnerving at first. Sure I was being mindful, but the more I paid attention to my thoughts; isolating ego and false self from True Nature; the more I suffered. It’s like that old saying: “Ignorance is bliss”. When our inner struggles are “out of sight and out of mind” we tend to move through life reactive instead of proactive. That is why addiction, self-gratification and religion are sometimes the opiates of society. The more I thought, the more I contemplated. The more I contemplated, the more I suffered. At times I wondered if it was worth all the trouble. Years later, I have self-evolved to the point that now I look back on those early days and see a different person. Granted, I still have a lot to learn and I am confident I will be learning until the day I die. Still, one major component to my self-reflection sticks out: The night and day comparison of ego verses our true self. I know I was not born with an ego. The ego is this facility that was born somewhere in adolescence and has been a part of my life to date. True, I have been able to separate the two entities in my head but it continues to this day to be a push and pull – a battle of good verse evil. Sometimes I wonder which side is my friend and at other times I wonder why the ego remains steadfast, despite my evolution. What purpose does the ego serve us? Is this the devil looking us directly in the face? I injured myself while in Kauai over New Years. I was bodyboarding a famous shore break called Brenneckes Beach and though I had the best tube ride in recent memory, the finale of the wave was me being pummeled into the sand bottom. A separated shoulder later; I was uncomfortable and in a lot of pain. The Emergency Room Doc prescribed Vicodin – something I have not taken in a while. (Now, a little about me… I am a terrible Buddhist: I have yet to give up my wine at dinner (probably never will) and if I do not have to suffer from pain, then bring on the little white pills. Hey, the last thing I am is perfect). So, weeks later, my shoulder is healing. It still hurts but it is more of a nagging pain rather than a sharp acute pain. Still, every morning, whether I need a pill or not, there is a little voice in my head telling me to take a pill. I have to laugh…. Maybe I am going insane? …CRAZY LAUGH*** …The mental chatter is endless – I am actually very impressed with some of the excuses and rationalizations for taking that little white pill. Trust me, I am far from addiction but it makes you now wonder what addicts struggle with. I guess my question is this… Is the ego a fixed entity within? Are we born with it and the pressures and situations in society awake the beast within? 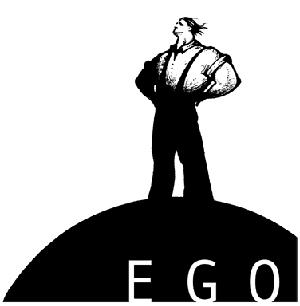 During my research for my upcoming book, I have stumbled across some interesting revelations about ego and false self. From my experience, the ego is an accumulated phenomenon, a by-product of living within society. Imagine if a child lives totally alone and isolated, he/she will never come to grow an ego. But that is not going to help in human evolution. This child will remain like an animal never progressing or evolving. It is a paradox of sorts: Our True Reality, sans of ego cannot be reached until we come into contact with our false-self; so the ego is a must. One has to pass through it and live it. It is a discipline or rite of passage growing up. How else would we know the difference between false self and enlightenment? A True Reality can be known only through the illusion (ego and false self). So it seems, those seeking enlightenment, are always destined to struggle with the ego and false self – it is evolution looking us straight in the eye. Do you suffer the same as I? This battle between our minds governing forces – between ego and our true self? Your comments are greatly appreciated. I remember being younger and being my true self, and I also remember having others trying to psychologically pummel it out of me. I succumbed and grew an ego, as you say. I don’t know if the ego is a must, and if I can keep finding ways to get back to my feral/natural self I would be happier. ‘Letting go’ of ego works best for me, rather than trying to wrestle with it. Kinda like that tug-of-war game, where if you let go of your end there’s no more battle. I take pain pills too, and alternate between ibuprophen and the generic version of Aleve, depending on whether it’s localized or all-over. If I could become a qigong master tomorrow, I wouldn’t need the pills. « BREAKING NEWS: Are Religions like Islam and Buddhism going extinct?